After a long week at work, there’s nothing more comforting than coming home on a Friday night and having some idea of what you’re going to serve your family for dinner. I really hate it when I don’t have a meal plan, especially on a Friday night when my creative reserves are fairly depleted. Having something already in mind can make all the difference in the world. It can, quite literally, make the difference between having a nice, relaxing night to end a long week … and the evening dissolving into a pool of frustration with no dinner in sight until much later than you’d like. For me, one of my favorite Friday night family meals is homemade pizza – a meal that’s easy, tasty and healthy, but also a wild departure from my Eastern European upbringing. So my plans for Friday night dinner generally revolve around something I can pull together fairly easily. Usually, I like to have all of the ingredients on hand. But if I don’t, I can pick up a few things fairly easily at Spera’s, our local meat market, on my way home. Stopping at a larger grocery store would just make my trip home longer, add too much stress to the end of the day and needlessly complicate the chore. For me, that’s an easy one to drop from the realm of possibilities on a Friday night. The selection also has to be fairly healthy. My husband and I are of the years when things like cholesterol, saturated fat and sodium content make a difference. I’m always fighting high cholesterol and constantly looking for ways to lower the number that appears on my yearly health risk assessment. And, of course, dinner must also taste good. I mean, what’s the point of eating anything if it isn’t delicious? 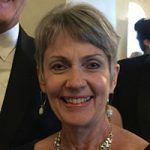 That’s a lesson I learned a long time ago … while growing up in a family where such Old World favorites as beet soup and stuffed cabbage with potatoes were the standard fare. When I was young, no one I knew ate such dishes. They were a far cry from the macaroni and cheese, fish sticks and French fries that my classmates lived on. Back then, my distaste for beet soup was so palpable that I was known to have sat for hours without so much as touching a steaming bowl of (purple-colored!) beet soup. 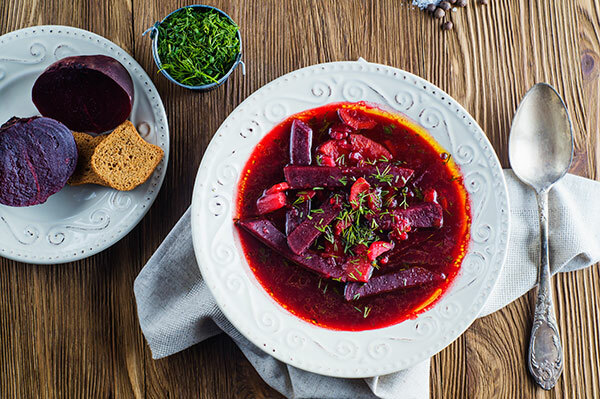 Now, of course, beet soup and stuffed cabbage are favorites of mine, and I can hardly recall what all the fuss was about, except that for me, as a first-generation American back then, it was. Vegetable pigments make beet soup beautiful and delicious. My attitude toward food changed when I was introduced to the art of cooking in home economics classes in junior high school. It was eye-opening to learn that there were endless combinations of foods and ways to prepare them that could actually look and taste good. Pretty soon, I was preparing the food I’d learned to cook in school at home, much to the surprise of my family. There was no end to the ribbing my brothers gave me about the grapefruit halves that I ran under the broiler and served as an appetizer with a maraschino cherry on top. For them, that was a wild departure from the mostly Eastern European, meat-and-potatoes dishes we were used to. My fascination for cooking continued after I got married and had a family of my own. I wasn’t going to serve them food that didn’t at least look appetizing and have some nutritional value. Bye mac & cheese. Hello tahini paste. Of course, when our children were little, my go-to meals tended toward kid-friendly macaroni and cheese, tuna noodle casseroles and homemade chicken nuggets. No one ever tired of these tried-and-true favorites, and they were simple and easy to make with ingredients that usually were on-hand. Our tastes became more adventurous and sophisticated as the years went on, though. Now, the staples that can usually be found in our refrigerator and pantry are things like hot chicken sausage in the freezer, kale in the vegetable crisper, and tahini paste, canned tomatoes with green chilies and just about every variety of beans you can think of in the cupboard. These ingredients can add zip and zing to just about any dish, and make something as mundane as Friday night dinner into FRIDAY NIGHT DINNER. More often than not, the dish that I go to when I think about Friday night dinner on my way home after a long week at work is homemade pizza. It’s a meal in one — no other sides, other than perhaps a salad, are required. It comes piping hot out of your oven — without ever tasting like the cardboard box that a delivered pizza tastes like. It’s satisfying and nutritious — dressed up with an endless variety of fresh vegetables. The fact that pizza can be satisfying and nutritious is probably the single biggest reason for choosing homemade pizza on a Friday night. The recipe below calls for hot chicken sausage (a healthy substitute for the usual pork sausage), but you can also use turkey pepperoni for something different. 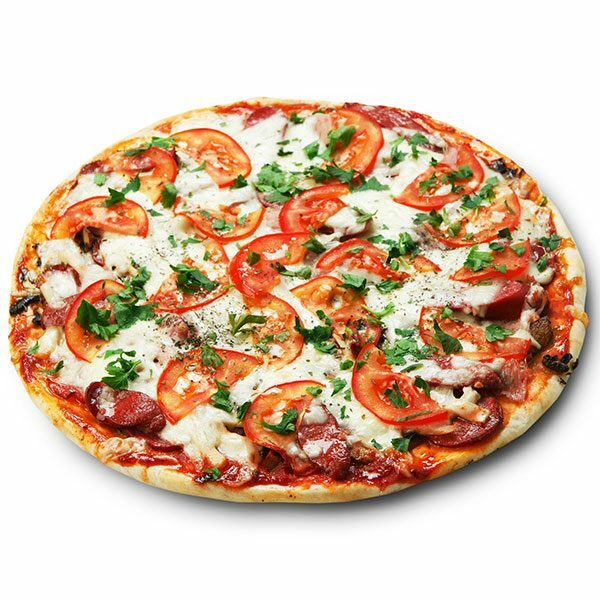 All kinds of vegetables and vegetable combinations go well with pizza. They’re especially tasty sprinkled with fresh herbs snipped from the pots on your windowsill or in your kitchen garden. Use those same herbs to make a pesto (frozen and later thawed) that adds a nice touch to homemade pizza in the winter months. When you make your own pie, you also have full control of the amount and type of cheese you use. Feel free to try lower-fat varieties, which may suit your tastes just as well as full-fat selections. Because you’re eating in, you can also afford to be choosy about your pizza dough. Here in Syracuse, there’s nothing like Columbus Bakery’s prepared pizza dough, but you may have other out-of-this-world dough suggestions from your favorite bakeries to recommend in the comments section below. You could even try whole wheat pizza dough as a healthier alternative. So have fun experimenting, bon appétit and please let us know your favorite homemade pizza recipes, topping combinations or other go-to Friday night family dinner recipes below. Preheat oven to 500 degrees. Stretch pizza dough to fit a round, lightly oiled pizza pan. Heat 1 Tablespoon of olive oil in a frying pan and cook chopped onion a couple of minutes until lightly browned. Add garlic and continue cooking for another minute or two. Add hot chicken sausage and cook until browned and crumbled. Cover pizza dough with desired amount of sauce. Layer with the sausage mixture. Top with chopped red peppers and other vegetables if desired. Sprinkle with seasonings and red pepper flakes for added kick. Place sliced tomatoes on top of sausage/vegetable/seasoning mixture, covering the pie. Brush any visible crust with olive oil and spray tomatoes with cooking spray. Place in preheated oven for about 10 minutes, but keep an eye on it. When it starts to rise and the crust just starts to turn brown, remove from oven and top with shredded mozzarella/cheddar cheese and then sprinkle with Parmesan cheese. Brush crust with oil again and return to oven just until cheese melts. Remove from oven, slice with pizza cutter and serve immediately!